Banksy made this exhilarating piece centering around Frenchman Thierry Guetta, himself (in his usual hooded brilliance), and the curious, and lamentable question of ‘What is Art?’. Watch! Banksy, Exit through the gift shop ! MBW is a good man. Not sure of Banksy though, in showing his ‘friend’ in not so good a light. Art is relative, art is not absolute, and its alright for MBW to find stardom. But MBW finding stardom reflects poorly on us peeps. hehe i liked the moment wen Mr MBW is giving media interviews bfore his grand show, he can’t get enough of the publicity lol. I think Banksy is a self centred chap. i like Gueeta better. Good one. There will be only one Banksy. Before and After. There will be many MBWs though. I like the ‘tour’ of Banksy’s secret hide-out. Not to be seen again. Who would want to show a good friend like Thierry in bad light. None other than Mr Banksy himself. Banksy does not laugh at himself does he, he always laughs at others. I’ve seen this movie 4 times and it’s very clear to me that Banksy wants to show what an annoying wannabe Thierry Guetta or, “Mr. Brainwash,” is. However, two of my friends fail to realize that Banksy uses clever subtlety to paint Guetta in a bad light. 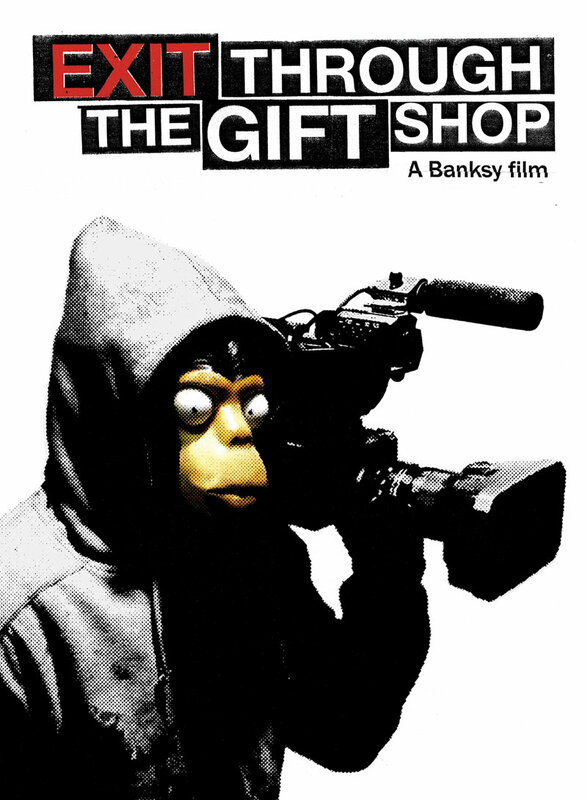 Isn’t “Exit Through The Gift Shop” a CLEAR diss to Thierry Guetta? Is clear as day to me. Anything is art eh.? hundredss lining up to see MBW. I am more interested in crafts, functional art, and fiber art opposed to the fine arts. I can draw/paint if I have to but it’s not what I prefer to spend my time doing. Photoshop is a powerful software, and most ‘artists’ these days are merely software driven like Thierry and his ‘photoshop assistants’. I like Banksy though, because he is fun. I loved Mr Brainwash (Thierry Guetta), he is essentially a good man, well intentioned..why should anyone feel bad that he arrived where he arrived..? i live in the desert and the powers that be were not releasing the movie here. I am a big Banksy fan so i can’t miss this movie. thank u so much for posting this watchable version. tired of soooo many fakes and dead end torrents. This is one thoroughly enjoyable ride! Thanks for posting. This has been on my to watch list for sometime. Wow, this is one amazing docu. Thanx for posting! In “Exit ..” Thierry Guetta makes a translucent sticker of himself with a video camera which he begins to stick everywhere. He then begins to scale this image to a larger size, but how did he put the image on this translucent sticker? Where can I find this material? How can I put the image on it? What are some rhetorical strategies banksy uses in the film? How effective are they?